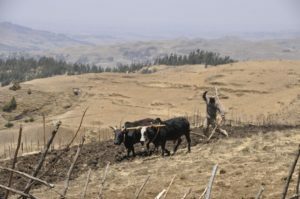 Every year, 12 million hectares of fertile land are degraded, its six-inch thick topsoil eroded, by drought and soil abuse. This land, that could produce 20 million tons of grain in a year, is turning into desert. Overgrazing: When grassland/plants are subjected to intensive grazing by large numbers of animals for long periods, without sufficient ‘recovery time’ for the plants to grow back, it results in permanent damage to the plant roots and causes the plant matter to die out. Deforestation: Indiscriminate cutting down of trees in forests for making land available for agriculture or livestock grazing results in soil erosion by rainwater, as there are no tree roots to hold the topsoil in place. This is especially true in hilly slopes where rainwater is predisposed to runoffs. Urbanization: Covering land with concrete – housing, roads, parking lots, factories, malls, etc. – blocks avenues for rainwater to seep down to the earth. This combined with excessive drawing of water from the ground, leads to severe depletion of the underground water table. Climate change: With increasing global warming, annual rainfall is becoming scarce and unpredictable. 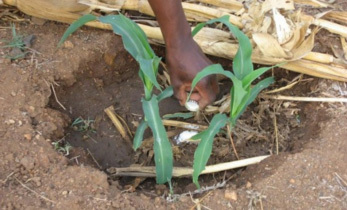 In arid regions, insufficient rain contributes to impaired growth of plants and crops. Tillage practice: Certain agricultural practices, such as overuse of chemical fertilizers, upset the natural composition of soil, degrading it and making it unsuitable for agriculture after a time. Other methods (clearing land by slash-and-burn technique) also render the land unusable for further growth of vegetation. When arable land turns into desert, it takes away the farmer’s ability to grow food, maintain livestock and feed their families. This loss of food security is the cause of poverty, disease, conflict and migration. Loss of local biodiversity is another issue linked to desertification. In order to stimulate public awareness on the issue, and to remind everyone that desertification can be tackled with community participation, policy changes and multi-level cooperation, in 1994, the United Nations declared 17 June to be observed as the World Day to Combat Desertification (WDCD). This is particularly relevant in the context of the current drought in Africa; almost 20 million citizens of Somalia, South Sudan, Nigeria, Kenya and Yemen presently face a crippling famine. With a view to countering the looming threat of drought and desertification, ICRISAT has been working with partners in several countries to increase productivity of farmers in the drylands, while protecting the land from degradation. It has introduced technologies, processes and agricultural inputs that can help dryland farmers cope with the challenges of climate change, and achieve the UN Sustainable Development Goals of No Poverty, Zero Hunger and Life on Land. 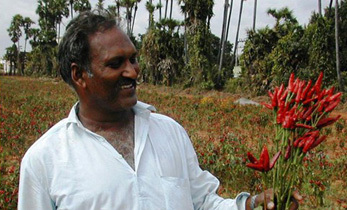 During the past four decades many approaches have been adopted in this direction; some of them are watershed management, improved crop varieties (tolerant/resistant to drought, heat, pests and disease), reinforced seed systems and markets, bio-reclamation of degraded land (BDL), digital agriculture and climate-smart villages. 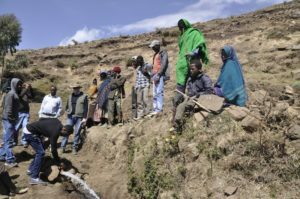 Yewol, Ethiopia: At 3500 m above sea level and 445 km from Addis Ababa, Yewol, in the northern highlands of Ethiopia, received unpredictable rain on its hard, rocky terrain and the residents faced poverty due to the harsh landscape and its associated difficulties. One of the main issues faced by them was soil erosion: due to sparse vegetation, the topsoil would be swept down the mountainous slopes by the rains every time, leaving the soil devoid of any nutrients to enable growing crops/trees. ICRISAT worked with the community members and local authorities to build stone terraces on the mountain slopes. Over time, these stone walls prevented runoff of rainwater down the mountain, helping it seep into the land and charge the groundwater streams. The availability of water increased the amount of irrigable land from 240 ha to 970 ha. 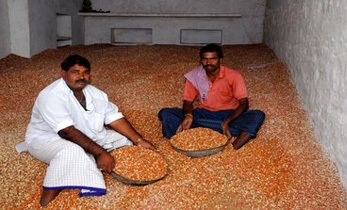 Farmers were able to grow more two crops per year, thereby increasing their earnings. Women had to walk lesser distances to collect water for their households. 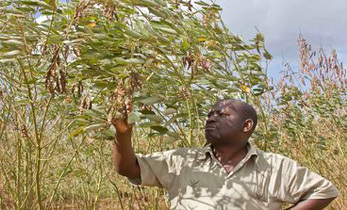 Diverse crops and trees such as moringa, carrot, chickpea etc. and fodder grasses such as tree lucerne were grown on the slopes, leading to a better, more balanced nutrition for their families than before. Farmers got better returns for their livestock, which they raised in a shorter time than before due to availability of good quality fodder. Crop rotation and diversification led to improved soil quality and subsequently, higher yields. Totally, the Yewol Watershed project transformed over 240 ha of degraded land into fertile, cultivable farmland with the cooperative efforts of the villagers (building the rock terraces), the local administration of Woreillu District (facilitating rainwater harvesting structures etc. ), and partners – Wollo University, Sirinka Agricultural Research Centre, UNEP*, ILRI** and ICRISAT (offering technical expertise and support). Niger: In eastern Niger, with most men having migrated to towns and cities in search of livelihoods, rural women struggled to make ends meet. Upon ICRISAT’s intervention, about 10,000 women were given small (0.2 ha) plots of land to farm and provided training about water harvesting techniques, best agricultural practices, etc. Under the concept of BDL, the women dug specialized pits for storing rainwater (zaï pits and demi-lunes) that they used to irrigate crops during the dry season. They also adopted the method of fertilizer microdosing – using small amounts of fertilizer close to the roots, as opposed to dumping large amounts of fertilizer in the fields. This gave them optimum crop yield without damaging the nutrient balance of the soil. Today, over 241 ha of once-degraded land is productive farmland in over 170 villages. By growing drought-tolerant, nutritious and high-value crops/plants, the farmers are not only adding substantially to their income, they’re also boosting the nutrition of their families. 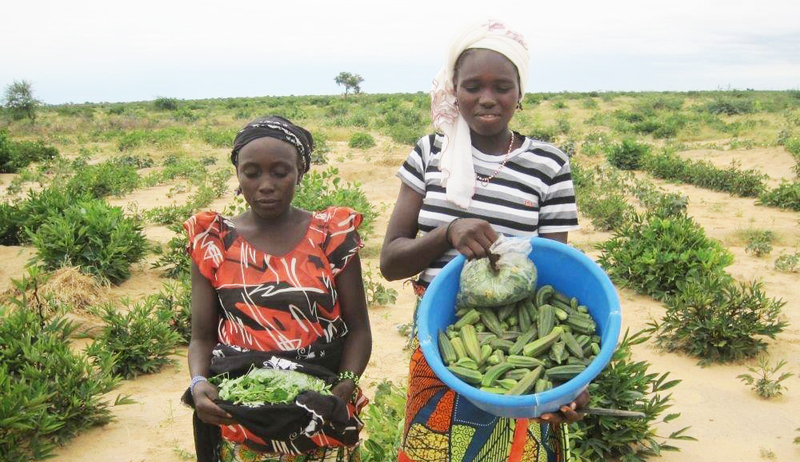 The women farmers in Niger stopped land degradation, while simultaneously raising their earning potential from the land. 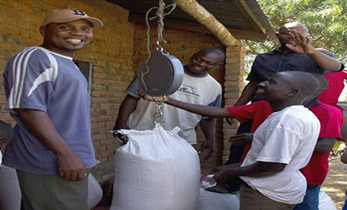 This project was funded by the United States Agency for International Aid (USAID) through Catholic Relief Services. ICRISAT was partnered in this project by the Government of Niger, GRET# and CADEV## Niger. These are but two examples of how science-backed, innovative interventions can go a long way in halting land degradation – eventually slowing the desertification of the drylands. Studies predict that by year 2050, 50–700 million people will be displaced due to environmental factors. People migrate to other regions of the world looking for food security, stability and employment opportunities. Therefore, this year, the World Day for Combating Desertification (#2017WDCD) focuses on the role desertification plays in large-scale global migration. It is important to remember here the UN SDG of Partnerships for the Goals. 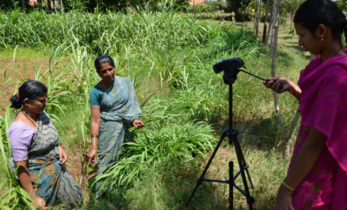 ICRISAT has a track record of successful partnerships with local and international organizations through which it has disseminated technological knowhow, skills and resources to combat climate-related issues, including food insecurity and malnutrition – two of the reasons for migration. As the #2017WDCD reminds everyone of land’s important role in producing food, generating local employment, and offering security to its inhabitants, let us synergize to ensure that more land is not eaten up by the desert! #2017WDCD will be officially observed on 15 June in Ouagadougou, Burkina Faso, the event hosted by le Ministère de l’Environnement, de l’Economie Verte et du Changement Climatique (MEEVCC). Rajani Kumar, Communication Officer, Strategic Marketing & Communication, ICRISAT. Nitrogen-efficient crops on the horizon: Can we grow more with fewer emissions?